As the snow starts to melt, the roads in Yellowstone National Park will be plowed and cleared in readiness for letting cars and trucks back in. (Of course, the road from the North Entrance at Gardiner, Montana, through the park to Cooke City, Montana is open all year. But notice that travel east of Cooke City via the Beartooth Highway is not possible from late fall to late spring.) Here are dates to use in your planning this spring. March 15: All remaining groomed roads close. 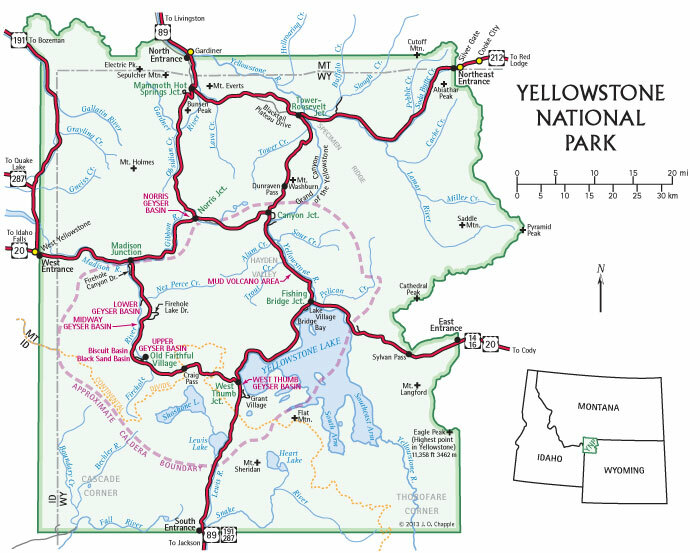 Credits: The image is the overview map on pages 1-2 of Yellowstone Treasures. 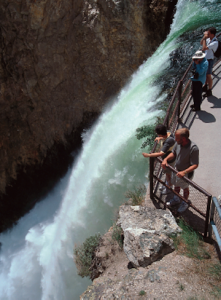 The helpful National Park Service Park Roads page provides the dates listed here and a live road map you can use to find out which roads you can drive on today. All roads close to public motorized vehicles at 8 am on November 5, 2018, except the road between the North Entrance and the Northeast Entrance. 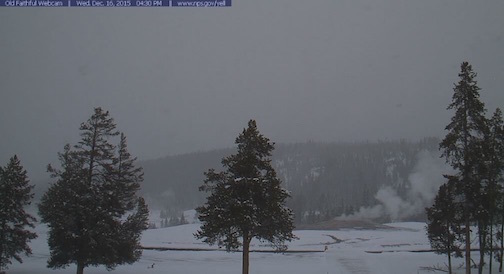 Outside the park to the northeast, the Beartooth Highway is closed, but the Chief Joseph Highway remains open. This is when the fall bicycling shoulder season begins. 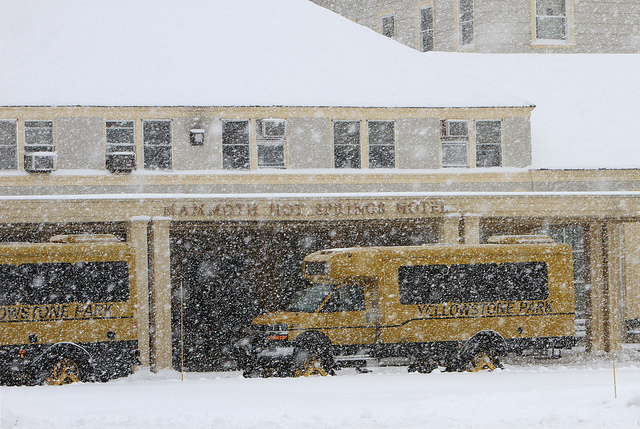 However, the weather forecasters are predicting wind and snow for this weekend, so conditions will not be ideal. 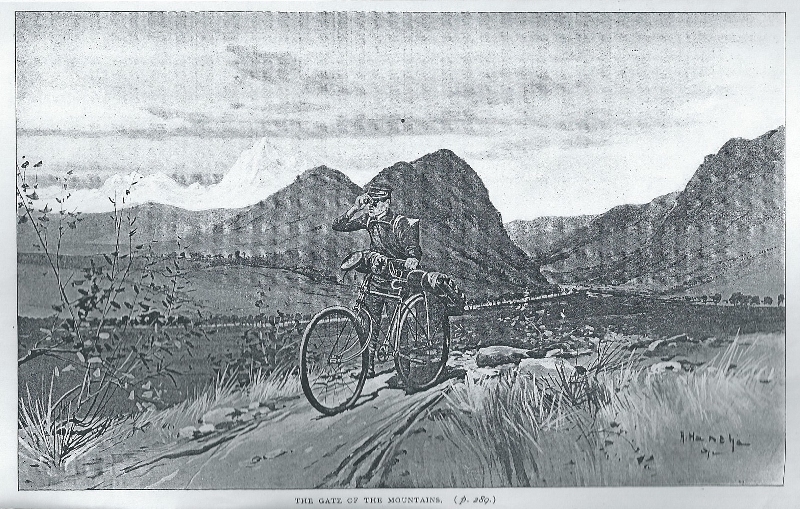 See the National Park Service’s Spring & Fall Bicycling for more. The shoulder season lasts until about the third week of November, when plowing operations stop so that enough snow can accumulate on the roads to support oversnow travel. Then the Grand Loop Road will open to snowcoaches and snowmobiles on December 15, ending the fall season officially. Photo credit: NPS photo from the Yellowstone National Park Flickr album, Jacob W. Frank, June 13, 2018. Once upon a time, a friend of mine who lives in Switzerland offered to meet me in a Yellowstone springtime to take pictures for my guidebook. He wrote that April would be a good time for him. But no, I wrote back, in April many roads are still closed, and the chances of more snow are still quite great. The park is totally closed for road plowing and other maintenance until mid April, and most facilities don’t open until some time in May. 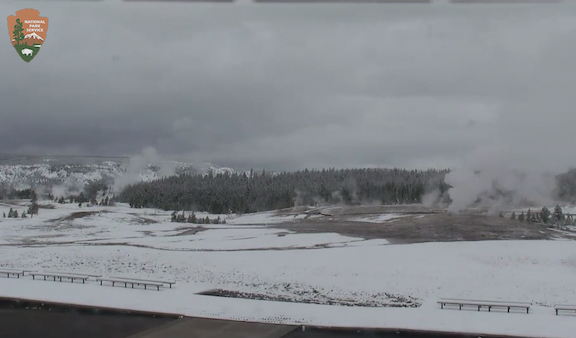 Today we are four days past the first day of spring in the northern hemisphere, but this is what I found this morning on the Old Faithful webcam. You will understand why spring is so late in Yellowstone, if you factor in that most auto-accessible areas in Yellowstone are at 7,000 to 8,000 feet (about 2,100 to 2,400 meters) in altitude. 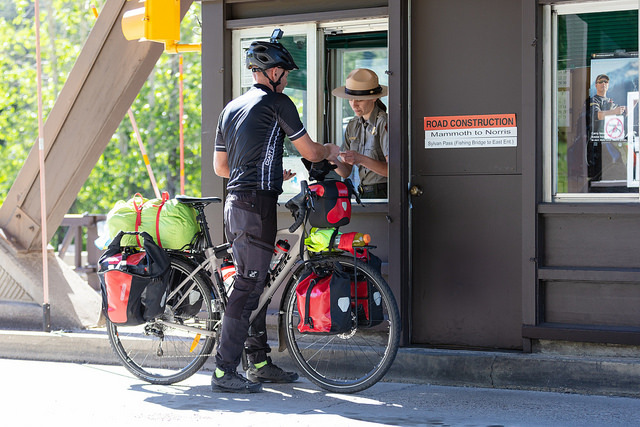 This spring the park roads will begin reopening on Friday, April 20th, when the West Entrance to Madison Junction, Mammoth Hot Springs to Old Faithful village, and Norris to Canyon Junction roads will open. Higher stretches of road open throughout May, with the last being the Northeast Entrance / Beartooth Highway opening on Friday, May 25th, for Memorial Day Weekend. This summer season you can expect construction delays of up to thirty minutes on the five-mile stretch between Apollinaris Spring and Roaring Mountain (Mammoth to Norris road); on some parts of the rim roads and trails at the Canyon of the Yellowstone; and along the East Entrance Road between Indian Pond and Fishing Bridge. 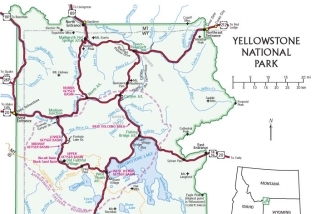 Year-round, for Yellowstone road conditions, take a look at this NPS park roads website. Or you may receive Yellowstone road alerts from the National Park Service on your mobile phone by texting “82190” to 888-777; an automatic text reply will confirm receipt and provide instructions. 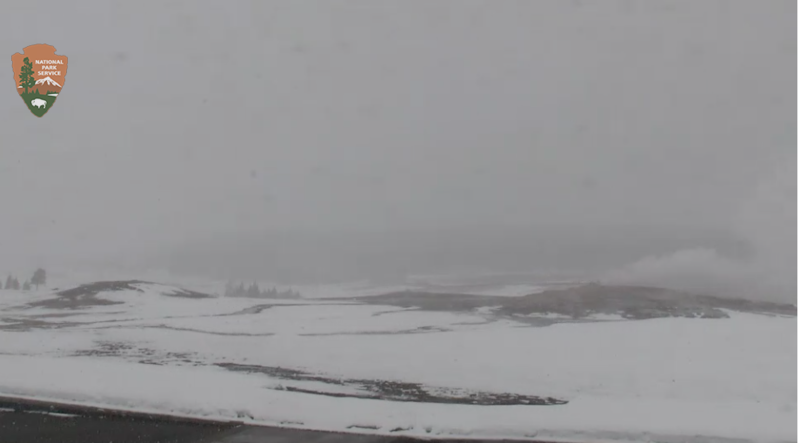 Although the Beartooth Highway and Dunraven Pass opened on time yesterday (May 22), cold and rainy weather is the norm right now in Yellowstone. From page 185 of Yellowstone Treasures, here’s the thrilling view you will not be able to access until the trail is rebuilt.